Violectric Debut Revolutionary LED Instrument Lighting “Violuminescence” at Bite. Bite Night, hosted by the Orlando Weekly was held at The Orchid Garden and Ballroom at Church Street in Downtown Orlando from 7pm-10pm on June 29th. I went to the event specifically to sketch the premiere performance of Violuminence. Michelle Jones the founder of Violectric asked her husband, Jerry Jones, the groups technical director to design the diodes along the rims of the instruments which made them glow like souped up Harley Davidson motorcycles. Violuminescence produces unique, lighted string instruments that can be remote controlled to enhance any performance in an unrivaled manner. When I arrived, the event was just getting started but there were already long lines for food. I immediately started hunting for my sketch opportunity. I ran into Ilene Lieber the groups pleasant and hard working PR representative and she let me know that the Violuminence performance would start at 9pm in front of the DJs table on the main floor. That gave me several hours to sketch in the Orchid Room's magical turn of the century decor. 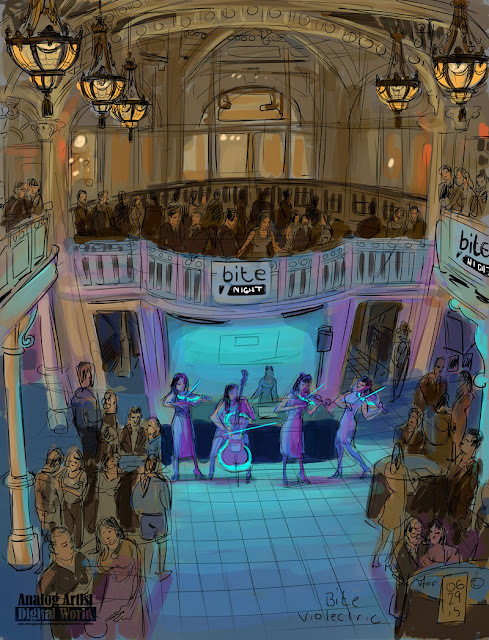 When Violumenence began, I added color starting with the blue glow of the instruments. The instruments glowed in every color of the rainbow as if celebrating the recent Supreme Court decision allowing everyone to share the rights of marriage. When the violins performed Journey's Don't Stop Believing, everyone in the room started singing along. "Shadows searching in the night". It was really a magical moment. The crowd was hooked and I sang along as I sketched. The violinists weren't passive. They began moving around the room finding their way through the crowd. By the time my sketch was done, the crowd was starting to thin out. All the food vendors had packed up. Darn it. I hadn't tasted a bite so I can't report on how good the food was. Genevieve Bernard and Seth Kubersky told me that the food directly across the room from me was absolutely delicious. I am pleased by the rich warm and cool colors that I could catch with my digital sketch. For more information on Violectric contact 407-434-1261 and for more information on Fretless Rock by Strings Etc visit their web page.